President Maithripala Sirisena instructed relevant Government officials today to cancel all deals with Avant Garde Maritime Services (Pvt) Ltd and hand over the maritime security operations back to the Navy. The President also instructed weapons on the floating armory operated by the Avant Garde to be handed back. Minister Rajitha Senaratne today said the President has ordered to hand over the operations of Avant Garde to the Sri Lanka Navy with immediate effect. 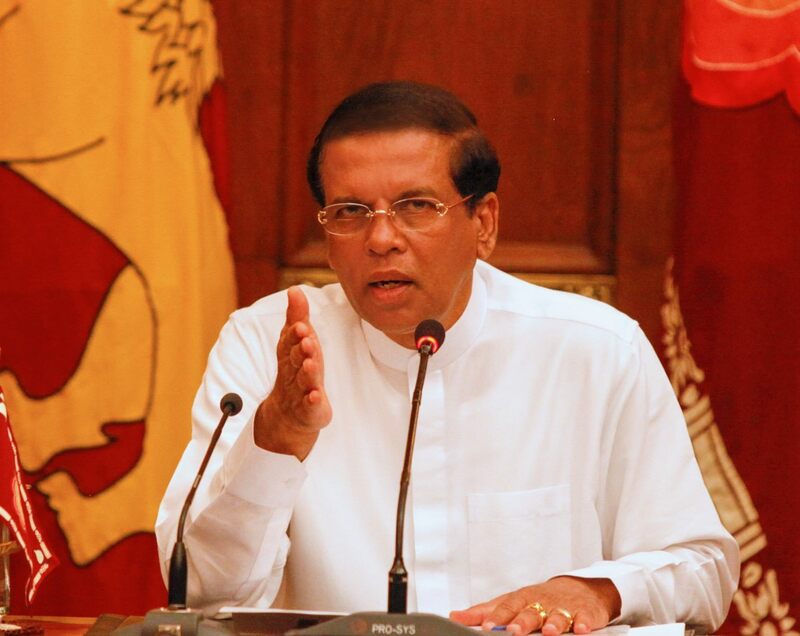 The decision was taken at a meeting held with the participation of President Maithripala Sirisena this afternoon. The navy cannot some of this work by law. It is also a BUSINESS VENTURE. Navy cannot do business right. This will ruin the company. None can match the STRATEGIC THINKING of GR. They can’t even come close. Obviously the GRAMASEVAKA has no clue. This is an calculated decision taken by some other agency and given to Maru Sira to do the Order. Could be RAW. 1.0 he has no clue as Lorenzo said to take a such a complicated and controversial decision. 2.0 he has no guts to take such a strong decision. These Idiots do not know that Sri Lankan Navy can not operate in international waters. They may take over the ship at Galle harbour, but ships operating in the Indian ocean will operate unhindered. Sirisena does not know that he can not rule Indian Ocean, poor GRAMASEVAKA who can not read any documents in English !!! Sira has no idea what he is doing. This government is undoing most of the good things the Rajapaksas did.Obviously he did this to please the diaspora. Same with the ECONOMY, WAR CRIMES INVESTIGATION, UNHRC. Can you guys remember MATHENAMUTTA STORIES at school? Exactly the same thing with these idiots. Once sunny day Marusiramutta and his 12 DUMBOS were called in to resolve a problem. Marapana goat has got the Avant Garde pot stuck in its head. Marusiramutta ordered to cut the neck of the goat and sacked him. Then he ordered to break the Avant Garde pot too. Ultimately the DUMB govt. LOST a BETTER minister and also lost the great services and forex earned by Avant Garde too. I have to COLLECT MATHENAMUTTA STORIES to better understand this foolish govt. Probably for the first time in the history A minister resigned for telling the truth to please the liars!!! This jahapalana gundas were boasting that under jahaplana forces will not be allowed to do business and wanted closed down all the restaurants and the hotels run by the Army and now the same idiots want the Navy to run Avant Garde business! It was given to Avant Garde because Navy was not capable of doing this in ths first place. It was given to Avant Garde because Navy was not capable of doing this in ths first place.- Some thing fishing here mate. I agree that no strategies other than those employed by Mahinda and Gotabhaya Rajapaksa would have enabled us to ensure that the Sinhalese could continue to safeguard Buddhism in its purest form. Therefore those strategies may have been necessary. However, now that those threats from the ruthless Tamil Tigers are over, ought we not to act more in keeping with the Dharma, and not apply modern business methods to the killing of human beings irrespective of what the issues are? I can’t help but feel that arms have been sold to both sides in certain conflicts, just as the Swiss, the Swedes and the Norwegians (who never go to war themselves) do. Impartial investigation is certainly necessary. What is going to happen to all of humanity if we help groups like ISIS become ever more powerful? Our dealings appear to have been with the Government of Nigeria, but is it not possible that we have been selling arms to Boko Haram as well? We cannot protect Buddhism if we adopt the mentality, the strategy and the morality of Brownrigg! Do we need to know English in order to know what is acceptable? Maithirpala may have betrayed the SLFP and his Leader, but the fact is that he appears to act out of certain convictions and principles (except in the appointment of Kumarasinghe Sira to Telecom). He was a Grama Sevaka, not a Grama Niladhari. We can defeat what Ranil’s UNP stands for only by cleansing ourselves.